When I was looking for Shirataki noodles, I also noticed kelp noodles which I had never heard of. I grabbed a package of those to try out. They're made with seaweed and when used as a raw food, they have a wonderful crunchy texture similar to those Japanese seaweed salads. I dropped them into this coconut soup which softened them a great deal, yet they didn't become mushy or anything like that. They held up when I reheated the leftover soup the next day! I couldn't discern much of a smell or taste, and came away mostly loving their texture both raw and cooked. These noodles are high in minerals and very low in carbs. The entire package (of 3 servings) only has 18 calories (3g carbs)! Plus they are gluten free! Combine the chicken broth, fish sauce, lemon or lime juice, ginger, garlic, honey or brown sugar, Harissa or chili sauce, ground corianger and red pepper flakes in a pot. Use the lower measurements, saving the rest for later when it's time to check to see if you need to adjust anything. Bring the mixture to a gentle simmer. Stir in the **bell pepper, kelp noodles and coconut soup. Heat up to just where it begins to boil. Check and adjust the seasoning if necessary; salty, sour, sweet, hot (the extra amounts you reserved). Remove from heat. Stir in the *shrimp, cilantro and green onion. Divide among bowls, Drizzle with a small amount of "hot" sesame oil, if desired. Serve immediately. *I'm working my way through a large amount of frozen cooked shrimp I purchased impulsively. If you prefer to use raw, then add the raw, cleaned shrimp to the soup just before you remove it from heat and cook a minute or two until they turn pink. Don't over cook as they might become rubbery. ** The bell pepper added at this point will be somewhat crunchy when the soup begins to boil. If you prefer a softer texture then add it sooner. OMG Looking so delicious..These noodles really awesome and have low calorie..
Salem, if you decide to make this, look for "3 Crabs" fish sauce. I've tried several kinds and I like that one the best so far. 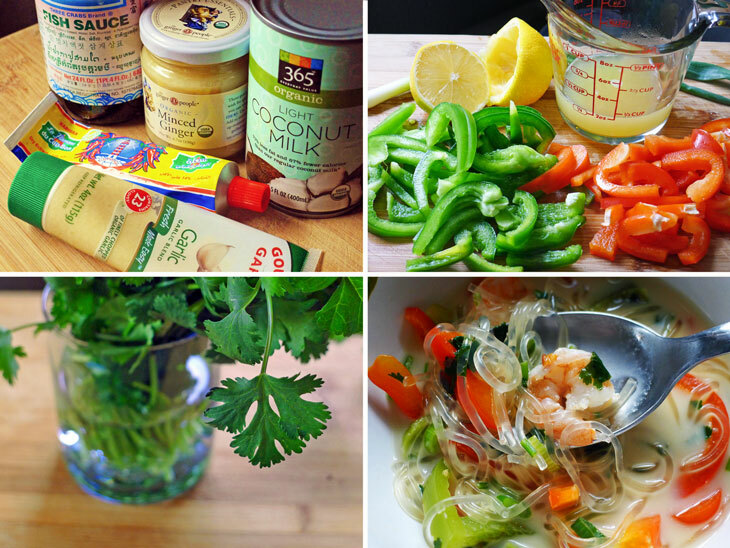 Did you find the kelp noodles at Whole Foods or an asian store? I'm in Dallas too, so a specific local suggestion would be great! This looks delicious! Joy, I found them at Whole Foods (Park Lane). They were in the refrigerator section near the eggs and tofu, and opposite the milk. This sounds so good. 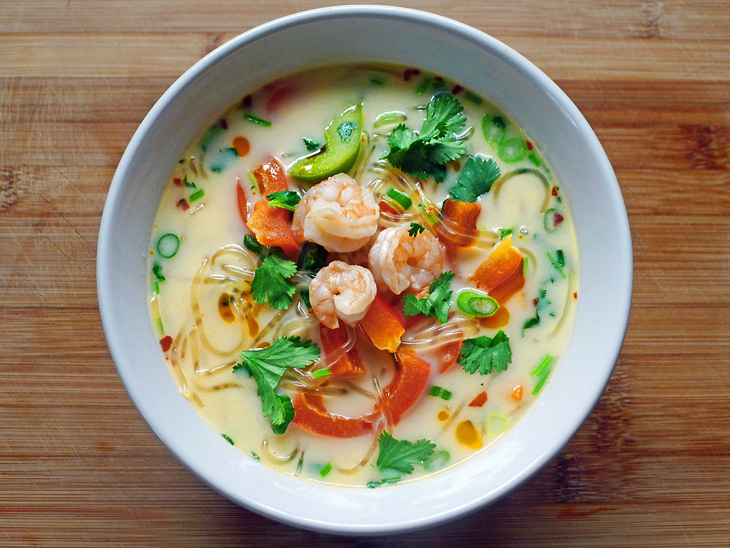 I love coconut milk soup and all forms of asian style noodles! This could not have come at a better time; I have a package of kelp noodles in my cabinent that stares back at me everyday when i am in there....i was just thinking this more how in the world am I am going to use you- well I believe I just found the anwser; a veganized version of this! I loved the noodles in this soup and plan on having it again soon. 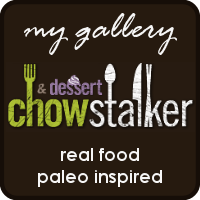 Hi Gerlinde, I just learned of you through Chowstalker. What a delicious-sounding recipe! I look forward to seeing and trying more of your great cooking. That is my favorite soup! Thank you Geraldine! Very cool idea! I love Shirataki noodels so much, but now I want to try the Kelp noodles too! We found the noodles and made the soup last night. It was so yummy! Thanks! Wow, great soup! So beautiful, colorful, with lots of vegetables. I'm sure is very tasty. Thanks for the wonderful recipe! This sounds good. Sounds very Thai. This was awesome! I doubled it & am currently eating the leftovers :) writing up a post to share on my blog, with credit to you of course! Thank you!! Bobbi, glad you enjoyed the soup. This is one of my favorite recipes. Very tasty soup! Have always wondered how to get that sweet salty sour taste and now I do... will definitely be making a bigger batch next time :). Thanks for posting! This dish has become an instant classic at our dinner table. Thank you for sharing this delicious and nutritious recipe! *I simmered my Kelp noodles in Lemon juice for 10 minutes. Ninah, glad you enjoyed the soup! Lemongrass is ideal for this soup. I often used lemon because I couldn't find lemongrass. Recently (out here in the PNW) I have come across tubes of lemongrass paste in the produce section which I love. After a long holiday from the kitchen, I have decided to return; at least on the weekends. I've organized my pantry and dusted off my camera. 100 Days Project - Day 33 - Moments Captured #littlethings #happiness #moments #justlife #caughtmyeye #ijustlike Sunday Roast. For more head here. Hobart Right Now - DARK MOFO is currently on and Hobart is looking pretty goood right now. Cooking Weekends by Gerlinde Scharinger is licensed under a Creative Commons Attribution-NonCommercial-NoDerivs 3.0 Unported License.